Over time I understood that the whole game of football is present in the Rondos (or “squares”, or “rectangles”, as they are technically and normally such shapes). When I say that the whole game of football is in there, I´m mainly thinking of two statements: (1) Rondos are very powerful weapons to develop smart football players; (2) Situations that arise in Rondos can be found in different areas of the pitch, they are part of the game itself. The key here (as with every single exercise that we´d like to provide to our players) is to understand why we do what we do, and under which game situations we may find them. To exercise Rondos just because they are cool may anyways bring up some benefits (i.e, to improve technique under pressure) but ultimately what we would like to see is that: (1) What we do has a strong connection with the game; (2) Players can make “right” decisions on their own; (3) Executions happen at the speed required by the game. Below are some game principles that can be taught (or that players may learn), areas on the field where Rondos can arise, and a very simple classification for Rondos (nurtured mainly by Dynamo Zagreb and Real Madrid Youth Academies). In football, we cannot replicate (thus, we cannot train) all the infinite different possible game situations. Therefore, players must understand the game on their own, and leverage on some game principles that would guide them to take decisions. Ultimately, they will make those decisions based on how they read the game, what they perceive and under which familiar scenarios they feel they are immersed. During attacking phase, it is very important to be able to break or generate gaps in opponent´s pressing lines, broadening the space among them, and among players within the same line. This can be achieved by providing width (making the field as wide as possible) and depth (positioning players, especially forwards, as far as possible to avoid concentrating many players in the same zone and thus one opponent being unable to mark two or more players at the same time). By providing width and depth, team with ball can generate spaces between opposing pressure lines. As a player, I need to be able to realize when I am under a “free man” situation, or when I can create “third man” situations. When I am the free man, I can generate a new passing lane to give progression of the ball into a more advanced area of the pitch and pass one, or sometimes two, lines of opposition pressure. The “third man” concept consists of creating triangles against (normally) two opponents. Say a teammate has the ball and wants to give the ball to another teammate on his right, but that he is being blocked by an opponent, who is marking the player with the ball and the one on the right. Another teammate can act as a “second man” by creating a vertical passing line (probably with an opponent on his back); player with the ball will pass the ball to him, who will normally play one touch to the original teammate they wanted to reach (third man). Player with the ball is first man, player creating the vertical passing lane is second man, and player receiving the ball (now without opponents) is the third man. Player with ball tries to get the ball to the third man (teammate on the right side) by looking for a second man (who is being marked, but can play one touch to the real free man). Playing directly to the right would have been very complicated to do. A corollary of the two concepts mentioned above is the following: As a player, I need to understand when I will be the direct beneficiary of a pass (free man) and when I will be the benefactor (that means that by doing the right movements I will be allowing other players to receive the pass and progress in the field). The Build-up Zone is the most risky zone, yet the one that can foster numerical superiority the most. Assuming two teams playing 4-3-3, this initial formation reveals a classic Rondo: 3v1. To dominate this type of situations can be trained, and improvement can be made by following the aforementioned principles (provide depth, width and understanding when a player is beneficiary and when benefactor, so as to make it really difficult for a single opponent to steal the ball against three players). Initial setup for two teams that would play 4-3-3. This setup already reveals a Rondo situation. A typical movement by left and right backs would be to move forward to the midfielders line. They would provide space to the full backs, who would make the field as wide as possible, making it harder for the single opponent to steal the ball. Side backs moving to the midfielders line allow full backs and goalkeeper to play 3v1 in a much wider field. As mentioned before, variations of situations in football are infinite. Thus, it should be the player who must decide what the best decisions are in milliseconds. In this situation, opponent forward doesn´t follow his marker. Right back is very likely to be free man (depending on what the opposing mid decides to do). The Progression Zone is normally a less risky one if the team loses the ball. However, it depends on the whole team to generate situations of numerical superiority. The following is just one variation of many. Under an initial 3v3, it´s the striker who decides to abandon his zone to create overloads (by positioning himself between defensive and midfield opposing lines). Forward may be able to turn or play third man. This movement is quite common, and it will generate doubts on full backs, who will have to decide whether to abandon their (critical) zone to mark him or whether to accept opposing team to play 4v3 in the center space. For the team with the ball, to take advantage of this 4v3 situation will pretty much depend on the whole team keeping appropriate distances and on each individual understanding whether they are beneficiary or benefactor. See the key role that side backs are playing by isolating opponents. In this situation, it is the striker who decides to abandon his zone and create overloads in the center space. 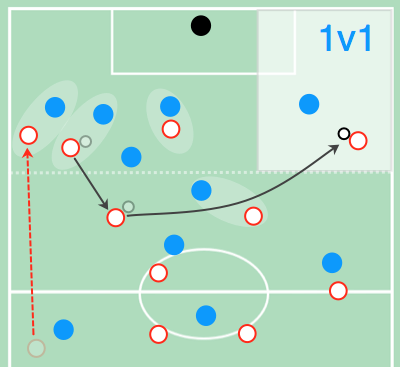 As mentioned before, it is not so easy to generate numerical or positional advantage in second third (it depends on a wide range of factors, such as whether there has been a good build-up, how fast the opposing team shifts and, logically, what decisions each single player takes at every single time). For instance, a 4v4 situation could be one where the opposing right winger decides to occupy the central space to neutralize team´s numerical superiority. Fast movements, providing support, and creating overloads will be key for keeping possession. In this case, one of the side backs will understand that they can become free man. Thus, he creates a new passing lane by moving forward on the pitch. Now, the situation is a 5v4. Left back creates new passing lane. He understands the context. Generates a 5v4 now. In the Final Third, it becomes quite impossible to generate numerical superiority (indeed, in most of the cases the number of opposing players will be larger than the team with ball). It will be very likely that team will try to look for 1v1 or even 2v1 situations, but if they happen, they will last only a few seconds (which means that team must make use of their creativity to penetrate). To generate a 2v1 in the final third is something that almost every team will try to look for, but very difficult to achieve. However, its low likelihood doesn´t mean that teams should refrain from trying. In this case, it is the left back who tries to overload. Under this scenario, it is key to understand the critical role that forwards and midfielders may play as benefactors, by isolating opponents. When you can´t progress through one side due to the presence of many players, it may mean that the opposite side may have a lot of free space. Thus, it is very common to try to overload a specific zone (say the left half space) so as to group defenders and then move the ball to a different side (in this case, the right wing). With these movements, team with ball may provide a very skilled player with the opportunity to play 1v1 near the goal. These are Rondos often used for warmp-ups and/or beginners, where normally players will stay in specific positions, and with much numerical or positional advantage (i.e, 4v1 with lots of space). The only objective is to keep possession. They have low cognitive demand. Normally, when the ball is lost, teams will have to meet several game principles (for example, team that loses ball will try to press immediately, and team that recovers the ball will try to play a safe pass to reorganize). The main goal is to be able to take the ball from one zone to a a different one. Teams will have to be creative enough and do the right movements in order to meet the goal (for example, by overloading one zone, providing support to teammates, making the pitch wide, etc).